There is no accounting for obsessions. Take the worldwide movement of the Doctor Who fans, who are all too familiar with being dismissed as sad cases - and worse. "Okay, so we are a bit weird, but at least, we don't shell out £30 to sit around in the cold and the rain watching 22 men kick each other and a round leather bag full of air, around the park," argues Steve Bennett. "What makes one group of obsessive fans somehow more 'acceptable' than any others? I doubt there is a person in Britain born before 1990 who hasn't seen a Dr Who episode at one time or another." Mr Bennett, 43, a health service worker from Crawley in Sussex whose other hobby is trainspotting, has been collecting Doctor Who videos since the 80s. His collection now holds nearly 90 tapes worth more than £1,000. He is not alone. Hospital chef and Scotland's most dedicated fan of the BBC sci-fi series, Colin Young has spent nearly £12,000 on his collection of videos and other memorabilia that includes a full-size Tardis and a tattoo of a dalek. Last summer, his collection formed part of Midlothian Council's Alien Invasion exhibition. Mike Gatting, the former England cricket captain, is reported to have a cabinet full of Dr Who videos, and playwright Mark Raven hill owns up to being an ardent aficionado of the Doctor, before he sold off his memorabilia to raise money during his cash-strapped college days. Steve Bennett got hooked on the Doctor back in the 70s when he saw the Claws of Axos, starring the third Doctor - Jon Pertwee. He says: "I liked the first episode that I saw, but at the end of the day it was just another TV show, albeit a very enjoyable one. But over the course of the next few weeks I became utterly enthralled. I remember going into school and desperately wanting to talk about it to everybody, as others had done before me. Now when I watch the tapes, our two boys Jamie, 12 and Gavin, eight, enjoy them almost as much as I do. I think ..."
Doctor Who was devised by Sydney Newman and Donald Wilson of the BBC in 1963. It was to be a science-fiction series aimed at children aged between nine and 14. The idea was to explore both science and history through a time/space machine, educating and entertaining the young viewers. The educational aspect was soon set aside as the programme's entertainment value soared. Towards the end of the 60s and certainly by the 70s the viewing age group was enlarged to include more adults. 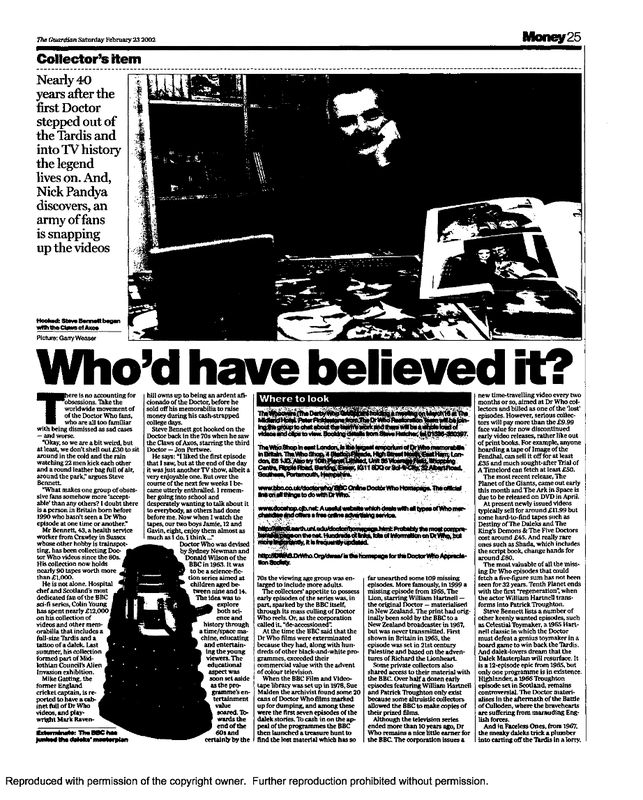 The collectors' appetite to possess early episodes of the series was, in part, sparked by the BBC itself, through its mass culling of Doctor Who reels. Or, as the corporation called it, "deaccessioned". At the time the BBC said that the Dr Who films were exterminated because they had, along with hundreds of other black-and-white programmes, exceeded their commercial value with the advent of colour television. When the BBC Film and Videotape library was set up in 1978, Sue Malden the archivist found some 20 cans of Doctor Who films marked up for dumping, and among these were the first seven episodes of the dalek stories. To cash in on the appeal of the programmes the BBC then launched a treasure hunt to find the lost material which has so far unearthed some 109 missing episodes. More famously, in 1999 a missing episode from 1965, The Lion, starring William Hartnell - the original Doctor - materialised in New Zealand. The print had originally been sold by the BBC to a New Zealand broadcaster in 1967, but was never transmitted. First shown in Britain in 1965, the episode was set in 21st century Palestine and based on the adventures of Richard the Lionheart. Some private collectors also shared access to their material with the BBC. Over half a dozen early episodes featuring William Hartnell and Patrick Troughton only exist because some altruistic collectors allowed the BBC to make copies of their prized films. Although the television series ended more than 10 years ago, Dr Who remains a nice little earner for the BBC. The corporation issues a new time-travelling video every two months or so, aimed at Dr Who collectors and billed as one of the 'lost' episodes. However, serious collectors will pay more than the £9.99 face value for now discontinued early video releases, rather like out of print books. For example, anyone hoarding a tape of Image of the Fendhal, can sell it off for at least £35 and much sought-after Trial of A Timelord can fetch at least £50. The most recent release, The Planet of the Giants, came out early this month and The Ark in Space is due to be released on DVD in April. At present newly issued videos typically sell for around £11.99 but some hard-to-find tapes such as Destiny of The Daleks and The King's Demons & The Five Doctors cost around £45. And really rare ones such as Shada, which includes the script book, change hands for around £80. The most valuable of all the missing Dr Who episodes that could fetch a five-figure sum has not been seen for 32 years. Tenth Planet ends with the first "regeneration", when the actor William Hartnell transforms into Patrick Troughton. Steve Bennett lists a number of other keenly wanted episodes, such as Celestial Toymaker, a 1965 Hartnell classic in which the Doctor must defeat a genius toymaker in a board game to win back the Tardis. And dalek-lovers dream that the Dalek Masterplan will resurface. It is a 12-episode epic from 1965, but only one programme is in existence. Highlander, a 1966 Troughton episode set in Scotland, remains controversial. The Doctor materialises in the aftermath of the Battle of Culloden, where the bravehearts are suffering from marauding English forces. And in Faceless Ones, from 1967, the sneaky daleks trick a plumber into carting off the Tardis in a lorry. APA 6th ed. : Pandya, Nick (2002-02-23). Who'd have believed it?. The Guardian p. Jobs, p. 25. MLA 7th ed. : Pandya, Nick. "Who'd have believed it?." The Guardian [add city] 2002-02-23, Jobs, p. 25. Print. Turabian: Pandya, Nick. "Who'd have believed it?." The Guardian, 2002-02-23, section, Jobs, p. 25 edition.